Gouvernement General de Bretagne divise en ses Dioceses ou Receptes. 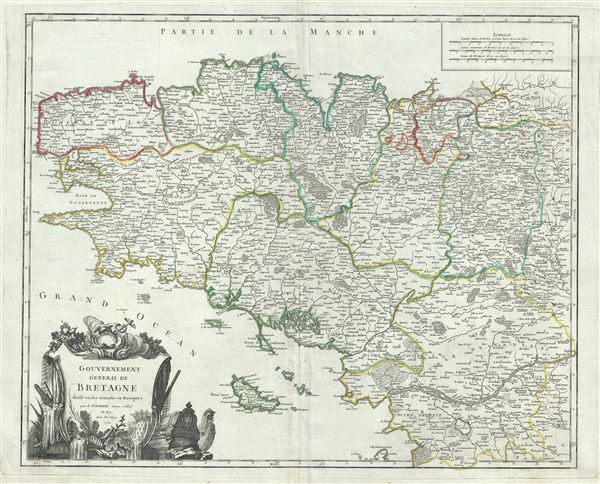 This is a beautiful 1751 map of Brittany, France by Robert de Vaugondy. It covers the former province of Brittany from Avranches south to Isle de Noirmoutier and from the Celtic Sea inland as far as Ingrande. The region includes the departments of Finistere, Cotes-d'Amor, Ille-et-Vilaine, Loire-Atlantique (previously known as Loire-Inferieure) and Morbihan. The map renders the entire region in extraordinary detail offering both topographical and political information with forest and mountains beautifully rendered in profile. The western region of Brittany (department of Finistere) is known for its cider production and excellent boar hunting. The Ille-et-Vilaine region, in the northeast of Brittany, is famous for its seafood, and especially oysters. The dramatic island and castle of Mont Saint-Michel is depicted just off the coast. The region of Loire-Atlantique, located in the southeast, is part of the Loire Valley wine region, and is especially known for its production of Muscadet, a white wine produced from the Melon de Bourgogne grape variety. This area is also famous for a variety of cow's milk cheese known as Fromage du Cure Nantais. Morbihan is an exceptionally beautiful part of the Breton cost noted for its many islands, many of which are now privately owned by movie stars, politicians, well known musicians and other influential people. Morbihan is named for its most unusual feature, a large inland sea near Vannes, itself called The Morbihan. This region is also the home of the mysterious megalithic ruins at Carnac. The map includes a beautifully engraved title cartouche in the bottom left quadrant. This map was drawn by Robert de Vaugondy in 1751 and published in the 1757 issue of his Atlas Universal. Vaugondy, R., Atlas Universel (Paris) 1757. The Atlas Universel was the crowning glory of the Robert de Vaugondy firm's atlas production. The atlas was revolutionary on many levels and exemplified the Vaugondy creedo commode, complet, univorme, et suive (convenient, complete, uniform, and easy to use). The atlas thus consisted of a wide corpus of maps, both modern and historical, was of moderate height and width, and featured maps of uniform style and structure. They partnered with Antoine Boudet, a shrewd businessman and publisher with whom they had worked previously, to produce the first edition. To minimize his fiscal risk, Boudet sold the atlas first by subscription using a large prospectus, receiving in the process over 1100 pre-orders. The first edition appeared in 1757 and contained beautifully produced maps with elaborate freshly designed allegorical cartouche work, generally by Pierre-Edme Babel, Pierre Philippe Choffard, and Charles Nicholas Cochin. Most of the maps were engraved by the Delahaye firm, the payment for whose services ultimately led to legal disputes. Despite proving a popular work of astounding quality, the Atlas Universal received harsh criticism from fellow cartographers, particularly Philipppe Buache. Ever at odds with the Vaugondys, Buache's critical perspective may have been influenced more by political maneuvering than academic affront. The atlas was issued in multiple editions between 1757 and 1788. Later editions, issued after 1786, were taken over by Charles Delamarche, who inherited the Robert de Vaugondy firm and assumed Boudet's publication rights. Very good. Minor wear along original centerfold. Original platemark visible. Some spotting and offsetting. Rumsey 3353.026. Pedley, Mary Sponberg Belle et Utile: The Work of the Robert de Vaugondy Family of Mapmakers, 105.